V&T train at (collapsed) Tunnel 1, around 1940 and in 2014. Note shoofly around old tunnel in both photos. The Virginia and Truckee Railroad is a privately owned historical heritage railroad, headquartered in Virginia City, Nevada in the United States. Its route is 14.1 miles (22.7 km) long. The railroad owns and uses the service mark "Queen of the Short Lines". The V&T Railroad runs up to seven trains per day, many in steam behind locomotive #29, a 2-8-0 Consolidation, or an ex-US Army GE 80-ton diesel from Virginia City from Memorial Day until the end of October each year. When first constructed in the 19th century, it was a commercial freight railroad (reporting mark VT) which was originally built to serve the Comstock Lode mining communities of northwestern Nevada. At its height, the railroad's route ran from Reno south to the state capital at Carson City. In Carson City, the mainline split into two branches. One branch continued south to Minden, while the other branch traveled east to Virginia City. The first section from Virginia City to Carson City was constructed beginning in 1869 to haul ore, lumber and supplies for the famous Comstock Lode silver mines. The public Nevada Commission for the Reconstruction of the V&T Railway has rebuilt the line from Gold Hill (connection with the current V&T Railroad) to Carson City, running the first train over the line in 68 years on August 14, 2009. The Commission acquired a 1914 2-8-2 Mikado steam locomotive (The McCloud no. 18), which had been in use by the Sierra Railroad, out of Oakdale, California, on special lunch and dinner trains. When the no. 18 arrived on the V&T, boiler problems were discovered, and the locomotive awaited repair at the Virginia and Truckee shops in Virginia City. She went to Hollywood for the filming of Water for Elephants. She returned after her scenes were filmed and had her first revenue run on July 24, 2010. Cars and locomotives from the original railroad are on display at the Nevada State Railroad Museum in Carson City, at the Comstock History Center on C Street in Virginia City, at the California State Railroad Museum in Sacramento and at the Railroad Museum of Pennsylvania in Strasburg. Gold was discovered in Nevada (then western Utah Territory) in spring 1850, by a company of Mormon emigrants on their way to the California Gold Rush. These early travelers only lingered in Nevada until they could cross the Sierras. By 1858 prospectors were soon permanently camping in the area around what is now Virginia City. :12 In 1859, gold was found in outcroppings in the hills and canyons just outside what is now Virginia City. Among the gold ore in these outcroppings were bluish chunks of silver ore which clogged the rockers. Silver was not recognized in this form, so initially, it was overlooked in favor of the gold, and later found to be quite valuable. :12 This was the first of the silver from what came to be called the Comstock Lode. The first lot of ore from the Yellow Jacket mine and in fact from the Comstock ledge - yet shipped over the railroad was sent down yesterday to the Yellow Jacket mill on Carson River. There were seven car loads of it, about eight and a half tons to the load, not far from 60 tons. This was from the 700 foot level of the old north mine, and dumped directly into the cars, the railroad passing within a few feet of the shaft. It is low grade ore, assaying $26 or $28 to the ton, and will yield under the stamps not far from $17 per ton. It is ore which heretofore was considered too poor to work and was accordingly used to fill up drifts with. The railroad now affords for the first time a chance to work this low grade ore profitably. - Gold Hill Daily News, The first Ore Shipment - Nov 19, 1869. In the chapter above from the Gold Hill Daily News, it states that low grade ore is valued at $26 – $28.00 to the ton. It also states that (after transportation and milling costs, 'yield under the stamps') the result would be around $17.00 to the ton coming back to the mine. Milling rates were about $7/ton. Based on an average of $27/ton of low grade ore, that left a freight cost of $3/ton. That one ton of ore could pay the wages for 3 experienced underground miners and a carpenter for a day. So you use your low grade ore to pay expenses, and reap the profits from the high grade. With the coming of the railroad, a reduction in freight rates for lumber by almost half occurred,:154 and the railroad could haul more material by the trainload, so mining activity would increase, creating more business for the railroad. Sharon's idea of low cost transportation paid off. Virginia & Truckee Railroad Right of Way, Reno, Nevada Historical Marker No. 248. This grade was constructed in 1871, and in use until 1950. In 1880, the V&T built a 3 ft (914 mm) narrow gauge railroad called the Carson & Colorado. The railroad ran from Mound House, just east of Carson City, to the southern part of California, and supposedly to the Colorado River where new mining claims were being struck. This never did pan out, and by 1891 those claim sites were all but forgotten. :23 A liability to the V&T, the "slim princess" was sold to the Southern Pacific Railroad in 1900. In the words of Ogden Mills, "Either we built this line 300 miles too short or 300 years too early" reflected V&T's attitude towards the railroad. The Virginia and Truckee's decline began as early as 1924, the first year in which the railroad had failed to make a profit. :27 Mining revenue had dropped off to very low levels, though revenue from the Minden line continued to flow. Passenger revenue was on a steady decline, due to the increased use of the automobile on the ever-expanding highway system in the US. :27 US 395 ran alongside the V&T from Minden all the way up to Reno and US 50 ran from South of Carson City over to Mound House and the turnoff to Virginia City. The sole owner of the railroad in 1933 was Ogden Livingston Mills, grandson of original co-founder Darius Ogden Mills. :31 He personally paid the deficits in the railroad's operating costs as a nod to the past and his family's involvement in the early days of Virginia City. :31 In 1938, a year after Mills' death, the railroad went into receivership, and its management began making plans to cease operations,:31 with the Virginia City branch already having been dismantled during that year. At the time of the railroad's closure, it had only three locomotives operating, the second no. 25 (2-8-0 built by ALCO in 1925), as well as numbers 26 and 27 (both 4-6-0's built by Baldwin in 1907 and 1913, respectively). The no. 26 was originally scheduled to haul the last train, but after making its run on May 1, 1950, the single-stall locomotive shed it was stored in caught fire. The 26, deemed as a total loss, was scrapped, and the road instead restored no. 27 for the occasion. On May 30, 1950, the no. 27 pulled the Virginia and Truckee's final train, rather fitting as experts considered, since the 27 was the last engine purchased new by the road. Lucius Beebe, a noted railroad historian, settled in Virginia City with Charles Clegg, a photographer and helped to revitalize the town and interest in the railroad by writing books about the Virginia & Truckee as well as other narrow gauge railroads, such as the Carson and Colorado Railroad, Denver and Rio Grande Railroad, Rio Grande Southern Railway, etc. See below in Bibliography. Virginia & Truckee "Tahoe", 1875, on display at Railroad Museum of Pennsylvania. The Virginia and Truckee's locomotives and other equipment appeared in numerous Westerns over the years since the railroad operated otherwise obsolete equipment well into the "cinema age." Many of these pieces have been restored, and are currently on display at museums throughout the country. In addition, an operating 5/8-scale replica of the V&T locomotive, Reno, has been running on the Washington Park and Zoo Railway since 1959. On April 18, 2018, The Nevada State Railroad Museum swapped No. 18 "Dayton" for No. 27. 27 will now be in the Comstock Historic Center, and The Dayton will reside in Carson City. 1 Lyon 2-6-0 H.J. Booth 11 (orig.) 1869 (orig.) - Replica currently under construction in Mason City, IA. 18 Dayton 4-4-0 CP's Sacramento shops Sac 6 1873 73002245 On display at the Nevada State Railroad Museum. 20 Tahoe 2-6-0 Baldwin 3687 1875 - On display at the Railroad Museum of Pennsylvania. 21 J.W.Bowker 2-4-0 Baldwin 3689 1875 - On display at the California State Railroad Museum. 22 Inyo 4-4-0 Baldwin 3693 1875 73002245 Operational, on display at the Nevada State Railroad Museum. 25 (2nd) Unnamed 4-6-0 Baldwin 25016 1905 - Operational at the Nevada State Railroad Museum. 27 Unnamed 4-6-0 Baldwin 39453 1913 04001198 On display at the Comstock History Center at Virginia City, Nevada. For the 1977 season, the railroad faced a motive power shortage. The only locomotive available was ex-Pacific Portland Cement Company #3, a small Porter 0-4-0T locomotive that was very small, lacking in pulling power (only being able to pull one car at a time), and produced so much smoke, an extension had to be added to the smokestack. It was also around this time that the railroad acquired three pieces of ex-Western Pacific equipment from a siding in Reno (two boxcars and a bay window caboose). One of the box cars was converted into an open-air car and given the number 55, the caboose was modified for passenger service and numbered 50, and the second box car was converted into a tunnel car, which proved very instrumental in reopening Tunnel #4. The car, numbered 54, was also used in passenger service until 2001. During the 1977 season, Bob Gray won an auction at the Longview, Portland and Northern Railway and walked away with 1916 Baldwin 2-8-0 #680. The locomotive was trucked to Virginia City and arrived safely (after many blown tires and having to sneak through Washoe due to trucks being forbidden in town on weekends). The locomotive was in good condition, and ran a charter train while still wearing its old identity. A month later, the locomotive was renumbered 29. Work to re-open Tunnel #4 continued until it was finally reopened in the late 1980s. Work had started on Tunnel #3 (which had a history of instability to the point that regular passenger cars could no longer fit by the time the last trains ran in 1938), but a large boulder shifted and buried the tunnel. A shoehorn was built around the tunnel, just enough as to not be too sharp for the locomotives, opening up a fantastic view of the valley. Conductors narrating the trip often erroneously state the tunnel collapsed in 1938, though recently, the correct information has been given. In 1984, the railroad acquired a former Southern Pacific 0-6-0 locomotive (#1251) from a park in Stockton, California. Tracks had to be built through the park to pull the locomotive onto a truck. Since arriving in Virginia City, the locomotive has been given the tentative number of 30, but has been partially dismantled, and no noticeable work is currently occurring due to lack of funds. The 1980s also saw the addition of ex-Feather River Short Line #8, a 1907 Baldwin 2-6-2. The locomotive arrived in operable condition, and was used alternatively with #29. During its career on the V&T, its number and lettering were never changed. The line was reopened to Gold Hill in 1991 and marked by a double-header pulled by #29 and #8. Regular service between the two stations began soon after. By 2001, #29 and #8 were out of service in need of work, as well as compliance to the Federal Railroad Administration's new boiler regulations outlined in 49 CFR Part 230. After the 2001 season, both locomotives were red-tagged by the FRA and taken out of service. No other steam locomotives were available, so, for the first time in V&T history, a diesel locomotive was used. For the 2002 season, the railroad leased ex-Quincy Railroad #3, a GE 44-ton switcher, from the Portola Railroad Museum (now Western Pacific Railroad Museum) in Portola, California. In 2003, another GE locomotive painted in V&T yellow and green and numbered D-2 (not related to the current D-2) was used. This locomotive's disposition is currently unknown. For the 2004 season, a more permanent Diesel was acquired in the form of ex-U.S. Army GE 80-ton switcher #1694. It was repainted in the same paint scheme as the first D-2 and given the number D-1. The locomotive served as the mainstay of the fleet while #29 and #8 were out of service. Engine #8 never ran on the V&T ever again due to a legal dispute with the Gold Hill Historical Society, the true owners of the locomotive, who claimed that the V&T ran the locomotive into the ground. In 2005, the Commission acquired a 1914 Baldwin 2-8-2 from the McCloud Railway. The locomotive, #18, is owned by the commission, but operated by the Grays operation. Officials with the Commission held a "silver spike" ceremony January 3, 2006, in Carson City to commemorate the completion of two miles of track near Gold Hill. The construction, completed in September 2005, is part of an effort to restore the V&T's mainline from Virginia City to Carson City for operations. Then Senate Minority Leader Harry Reid (D-Nev), who was instrumental in securing $10 million in federal funding for the project, and Nevada Lieutenant Governor Lorraine Hunt, who secured an additional $1 million in state funding for the project, both spoke at the ceremony. The completion of the first phase of the extension saw the last train of the day venturing beyond Gold Hill and to American Flats, over a massive fill of the Overman Pit, near the Crown Point Ravine. This practice has been abandoned in recent years, though. It is estimated that completion of the line from Gold Hill to Carson City will cost in excess of $55 million, and it is hoped that the line, which was originally abandoned in 1938, was planned be completed and operational once again in 2012. However, as of 2019, trains only go as far as Eastgate Station. In June 2008, #29 returned to operation after a significant overhaul. On August 14, 2009 the ceremonial first run from Virginia City to Mound House (referred to as "Carson City Eastgate" in official material) occurred for VIPs. On the 15th and 16th the line opened to the public. Funds raised from these runs will be used to pay for the tracks through Brunswick Canyon, and will continue throughout the fall, every Saturday from August 22 through October 31. The runs will use the V&T Railroad's equipment (such as steam locomotive #29) and not that of the V&T Railway (owned by the Commission). Ticket price is set at $48. The railroad is currently building up its collection, acquiring passenger cars from the nations museums and other private owners. In May 2010, an ALCO S-4 Diesel engine was acquired from Montana in operable condition. It has been numbered D-2 (the number previously used for the locomotive used for the 2003 season). On July 24, 2010, the No. 18 steam locomotive was brought on-line for revenue service. The locomotive had recently come back from Hollywood, appearing in the movie Water for Elephants. In December 2010, an ex-CB&Q rail car was trucked into Virginia City. It was to be operational in time for the 2011 season, but is still undergoing restoration work. The V&T had previously acquired a motorcar in 1976, No. 50 Washoe Zephyr. It is currently at the Nevada State Railroad Museum in historical paint. D-1 was fitted with a rare Hancock 4700 air whistle for the 2011 season so it would be more pleasant-sounding than the loud, booming Nathan horn it previously. The whistle was rebuilt by the Rizzoli Locomotive Works in Niles, California for the 2014 season. Also in 2011, a permanent water tank was built at the switch to the engine house. In mid-2013, the V&T acquired the original 1870 passenger depot, which had been a private residence with several cabooses and a V&T speeder on display. All ticketing and gift shop operations moved from coach No. 25 (which had been used as the depot since 1976) to the depot. The tracks were also slightly extended to the depot, and a new waiting area with a lawn and benches was built. Short trips now originate and terminate at the depot, rather than next to coach No. 25. Long trips continue stopping on the siding directly next to F Street. Originally, operations were to have been moved to the historic freight depot at E and Sutton Streets, which would see Tunnel #6 reopen. This plan was eventually abandoned for being too expensive. In May 2013, the railroad acquired a GE 44-ton switcher engine and three passenger cars from the defunct Yuma Valley Railway. The diesel has been given the number D-3, and began preliminary testing in April 2016. D-3 entered passenger service in June 2016 to substitute for D-1, which was out-of-service at the beginning of the 2016 season with an unspecified problem, before both locomotives began alternating. D-3 was equipped with a Hancock 4700 air whistle similar to the one used by D-1, and was repainted into the railroad's diesel and passenger car color scheme in July 2017. The passenger cars are in good condition, with two stored at Scales Siding and the third, the observation car Jersey Lil, is used as a diner at the Virginia City depot. The railroad hosted its first Day out with Thomas event on October 24, 2015, utilizing the three Pullman cars and D-2. The observation car Ardelle Mae, several of the privately owned cabooses, and the observation car from the YVRR were used to create a makeshift activity center with arts and crafts, and a meet-and-greet with Sir Topham Hatt. In November 2016, the railroad acquired an EMD SW1200 from Evraz, numbered 3540. The locomotive has since been renumbered D-4, arrived in an operable state, and has partially been repainted into the railroad's colors as of December 2017. The following is a list of the locomotives currently owned by the reborn V&T. No. 18: Ex-McCloud River Railroad No. 18. Baldwin 2-8-2 built in October 1914. Leased by the commission to the V&T Railroad. Inoperable for 1,472 day inspection as mandated by the FRA; slated to return to operation in 2019. The locomotive still wears her old McCloud lettering and number. No. 29: Ex-Longview, Portland and Northern Railway No. 680. Baldwin 2-8-0 built in October 1916. Acquired by V&T in 1977. Restored 2001–08. Named "Robert C. Gray". Operable. No. 30: Ex-Southern Pacific No. 1251. Built at SP Sacramento Shops in November 1919. On display in Stockton, California from 1957 to 1984. Arrived in Virginia City in July 1984. Inoperable and partially dismantled. Funds are short to restore the locomotive to operation and is stored at the Virginia City engine house awaiting funding. Tender stored at Donavan Siding for firefighting purposes. No. 8: Ex-Feather River Short Line No.8, née Hobart Southern. Stored operable in Mound House, with no plans to return to service on the V&T in the near future due to it being owned by the Gold Hill Historical Society and not the V&T. Baldwin 2-6-2 built in 1907. Was steamed up on Memorial Day 2012. No. D-1: Ex-US Army No. 1694. General Electric 80-ton switcher built in 1953. Arrived in 2003. Operable and in daily service. Formerly fitted with a Nathan K3LA, but was later replaced by a Hancock air whistle. No. D-2: Ex-PPL Montana No. 101. ALCO S-4 built in 1951. Arrived in May 2010. Operable. No. D-3: Ex-Yuma Valley Railway No. 3; née USMC. GE 44-ton switcher built in 1943. Arrived in May 2013. Operable and in daily service. Repainted to V&T colors in July 2017. No. D-4: Ex-Evraz No. 3540, nee BNSF 3540, BN 205, NP 146. EMD SW1200; built in 1957. Acquired November 2016. Operable. The railroad also owns a second 44-tonner acquired sometime in 2018 for use as a spare part donor. No information on this locomotive is available. No. M-1: Ex-Chicago, Burlington and Quincy Railroad No. 507, later No. 9507. Built by Edwards Rail Car Company in 1926. Arrived in December 2010. Inoperable due to small wheels; used as a woodshop. No. 25: Combination Car. Ex-San Francisco and North Pacific Railroad No. 37, later Northwestern Pacific Railroad No. 37. Arrived in 1975. Used as the Virginia City Ticket Office 1976–2013. Built in 1888 by Harlan & Hollingsworth. No. 50: Ex-Western Pacific Railroad bay-window caboose. Built in 1916. Entered service in 1977. Serviceable and in daily use. No. 51: Bay-window caboose. Used in passenger service between 1999-2001. Origin and current status unknown. No. 55: Ex-WP Box Car. Converted into an open-air gondola. Built in 1916. Entered service in 1977. Serviceable and in daily use. No. 54: Ex-WP Box Car. Converted into a tunnel car, but capable of carrying passengers. Possibly built in 1916. Last used in passenger service in the mid-1990s. It is, however, still used on the Labor Day and Civil War trains, as well as work trains. Serviceable. No. 100: Ex-Bangor & Aroostook parlor car No. 100. Named "Ardelle Mae", unofficially "Reno". Built in 1907 by American Car & Foundry. Used for special events. No. 101: Ex-Delaware, Lackawanna and Western Railroad coach. Built by Pullman Company in 1914. Named "Gold Hill". Arrived in July 2008 and entered service in May 2009. Serviceable. No. 102: Ex-DL&W coach. Built in 1914 by Pullman. Named "Silver City". Entered service in May 2009. Serviceable. No. 103: Ex-DL&W coach. Built by Pullman in 1917. Named "Carson City". Entered service in September 2010. Serviceable. No. 104: Ex-SP coach No. 1165. Built in 1909 by Pullman. From Tehachapi, California. Serviceable; used as a work coach. The V&T also owns several coaches that are currently stored in the Virginia City yard in a dilapidated state. One of the coaches was the private car of General Robert E. Lee, while another was a presidential car used by the Mexican Government. The Silver Short Line: A History of the Virginia & Truckee Railroad, Ted Wurm & Harre Demoro, (1983, Trans-Anglo Books) (ISBN 978-0-87046-064-7). ^ Lohse, Jim. "Popular Nevada and V&T Myths: Comstock Silver and the Civil War, State Seal". Train Arts. Retrieved November 23, 2009. ^ a b c d e f g h i j k l m n o p q r s t u Wurm, Ted (1992). Rebirth of the Virginia & Truckee R.R. May-Murdock Publications. ISBN 0-932916-16-3. ^ a b c d e f g h i j k l Myrick, David F. (1962). Railroads of Nevada and Eastern California, Vol 1: The Northern Roads. Howell-North. ISBN 0-87417-195-4. ^ a b c d e f g Koenig, Karl R. (1980). Virginia & Truckee Locomotives. Chatham Publishing Company. ISBN 0-89685-102-8. ^ "V & T Locomotive Roster". Nevada State Railroad Museum. Retrieved March 12, 2006. ^ Haight, Abby (June 21, 2009). "Oregon No. 1 chugs through its golden anniversary party". The Oregonian. Portland, Oregon. p. B3. Retrieved May 3, 2011. ^ "Voters reject tax for Virginia & Truckee project". Trains. November 6, 2008. Retrieved November 6, 2008. ^ "Virginia & Truckee Railroad Company - Timeline | Facebook". April 28, 2016. Retrieved September 16, 2016. ^ "Existing Equipment Roster". VIRGINIA & TRUCKEE RAILROAD HISTORICAL SOCIETY. Retrieved November 23, 2013. ^ "Gold Hill Historical Society". GOLD HILL HISTORICAL SOCIETY. Archived from the original on January 3, 2014. Retrieved February 16, 2014. ^ "HIKED out to the TRAIN! 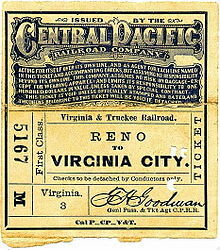 Virginia & Truckee RAILROAD". YouTube. Retrieved June 19, 2016. ^ "3 MINUTES/ A VISIT TO: Virginia City, Nevada Revisited/ Part 3/ 1999". YouTube. RonHamill818. Retrieved April 10, 2019. This page was last edited on 25 April 2019, at 04:38 (UTC).